A perfect weekend breakfast or quick and easy dinner. 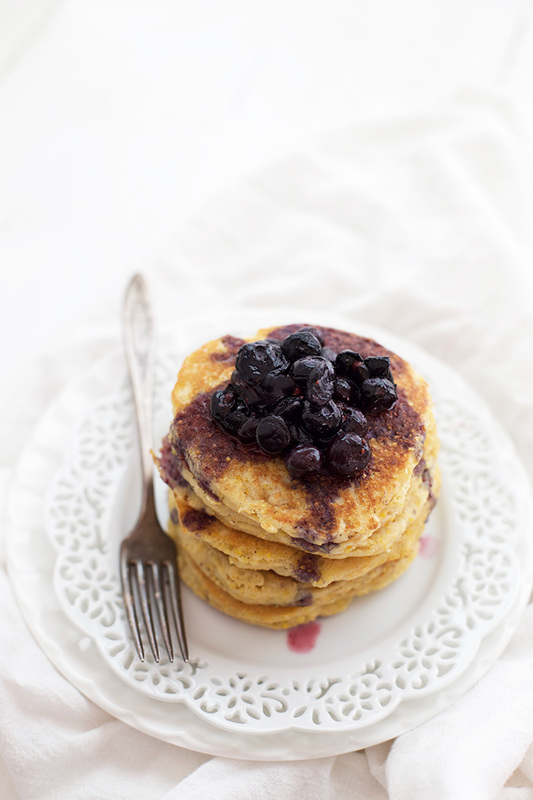 Cornmeal pancakes are one of my childhood favorites. My mom would make them with a box of Jiffy cornbread mix, and I just loved the texture. 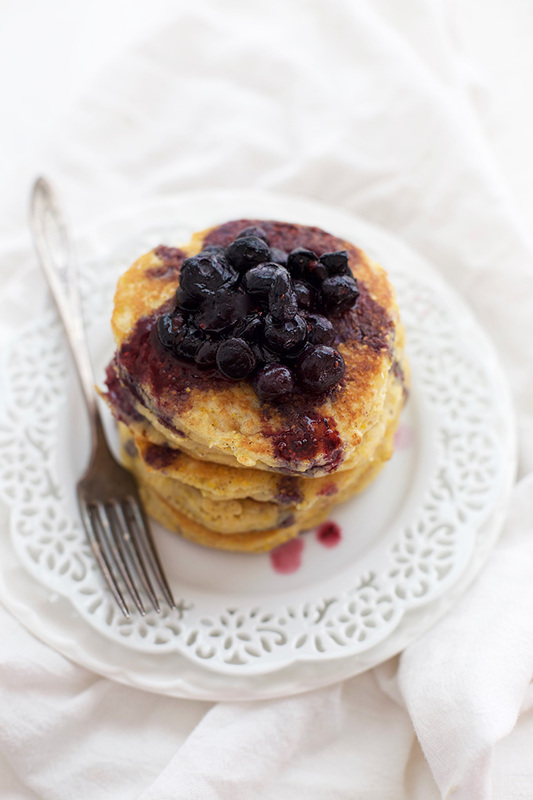 Cornmeal pancakes have an awesome texture. It’s a little bit crispier on the outside than typical pancakes, and the insides are fluffy but substantial, like light, airy cornbread. They’re a rustic, home-y little piece of heaven. This is one of those recipes that’s perfect for lazy weekend mornings (or nights when you don’t have much on hand/your dinner plans fell through). 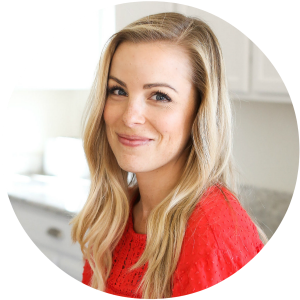 The ingredient list is short and sweet, with very basic ingredients you likely already have in your pantry. As for the blueberry syrup, I love blueberries in my pancakes. My children have feeeeeelings about me “ruining” their pancakes with blueberries IN them. 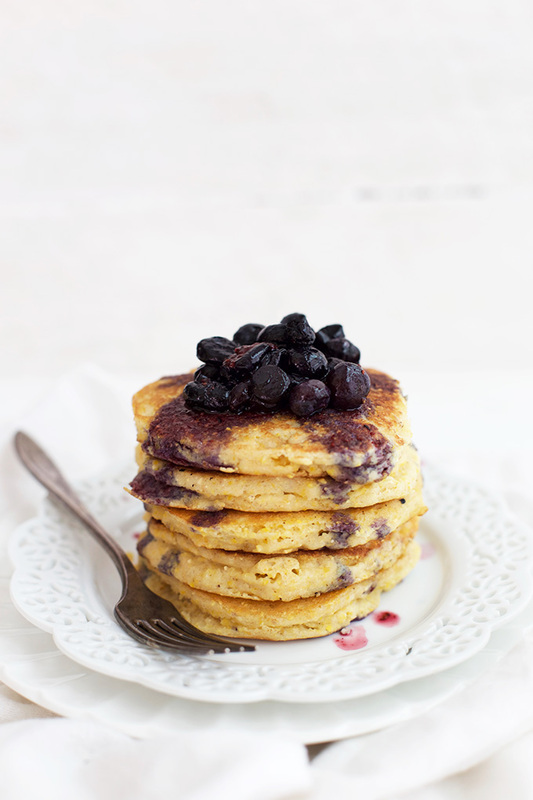 However, they love blueberries ON their pancakes (who even knows, guys), which makes a blueberry syrup the perfect answer. 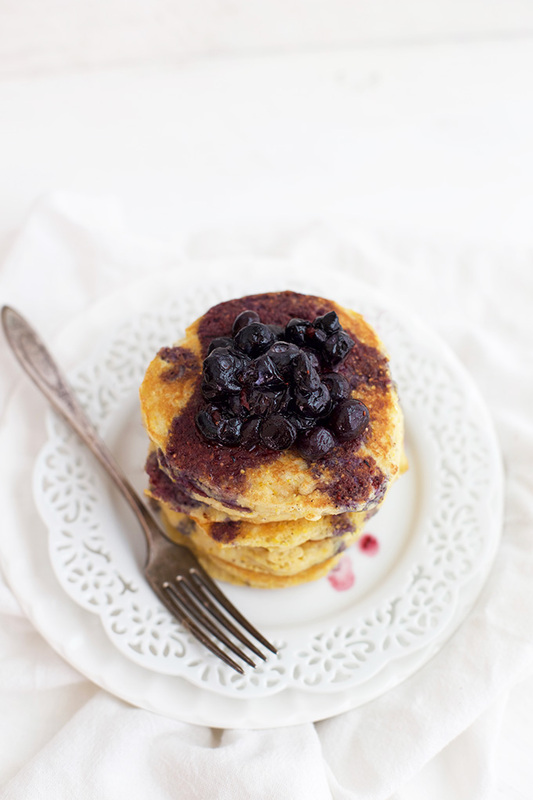 The syrup uses frozen blueberries (so you can make this in the dead of winter just as easily as the first day of school or on a spring break), with just enough maple syrup to elevate everything to the next level. You’ll want to add these to your next weekend. Toppings. 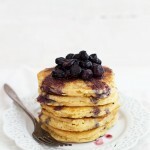 I’ve included a recipe for blueberry maple sauce below, but don’t let that stop you from trying other ideas! Whipped honey butter, maple syrup, strawberries or peaches and cream… the options are endless! Change it up. 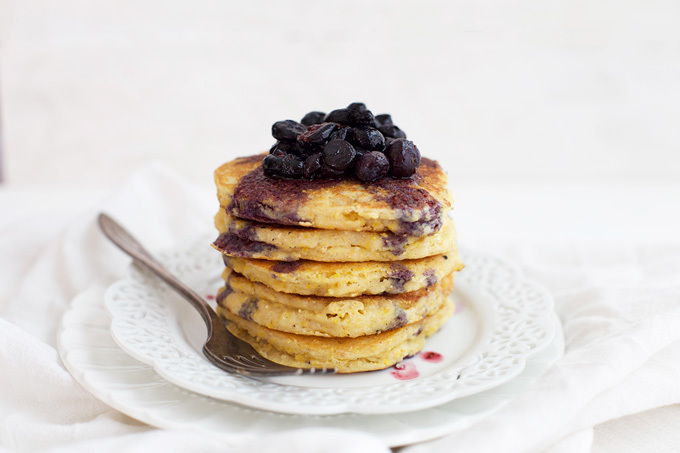 Feel free to add blueberries to the actual pancakes instead of just pouring them on top with the syrup. Use frozen (don’t thaw) or fresh berries and add just a few to the surface of each pancake right after you pour the batter into the pan. I’ve found that by adding them to individual pancakes, there’s less “bleeding” into the rest of the pancake (which my children consider an unpardonable offense). Chocolate chips also work. I’m just saying. Consider cast iron. I feel like my best pancakes come off my cast iron skillet vs. those I cook on a nonstick pan or a big griddle. The outsides just get so beautifully golden, I can’t go back! I add a tiny layer of cooking fat (you can use butter, vegan butter, ghee, etc.) to the pan between every 2-3 batches and keep the heat fairly low (cast iron retains heat so well that they’ll scorch if you keep the temperature too high). The cornmeal will soften as it sits in the batter, so if you can, do try to let the batter rest for a few minutes. It really improves the pancakes. Also, if you like thinner pancakes, simply add a little more milk to the batter. In a large bowl, whisk together flour, cornmeal, baking powder, and salt. In a medium bowl, whisk together milk, syrup, butter/oil, eggs, vinegar, and vanilla. Pour the wet mixture into the dry mixture and stir to combine. Allow batter to rest (in the refrigerator or on the counter) for 10 minutes up to an hour. (I put it in the refrigerator if it’s going to be longer than 30 minutes). When you’re ready to cook the pancakes, heat a skillet over medium-low heat. Grease the skillet with a little additional oil/butter. Use 1/4 cup scoops to measure out the batter into the pan. Cook 3-4 minutes, or until bubbles start to form on the top of the pancakes (these pancakes are thick, so you really need to watch). Flip and cook another 2-3 minutes, or until cooked through. If needed, reduce the heat in your skillet so that the insides cook before the exterior gets too browned. 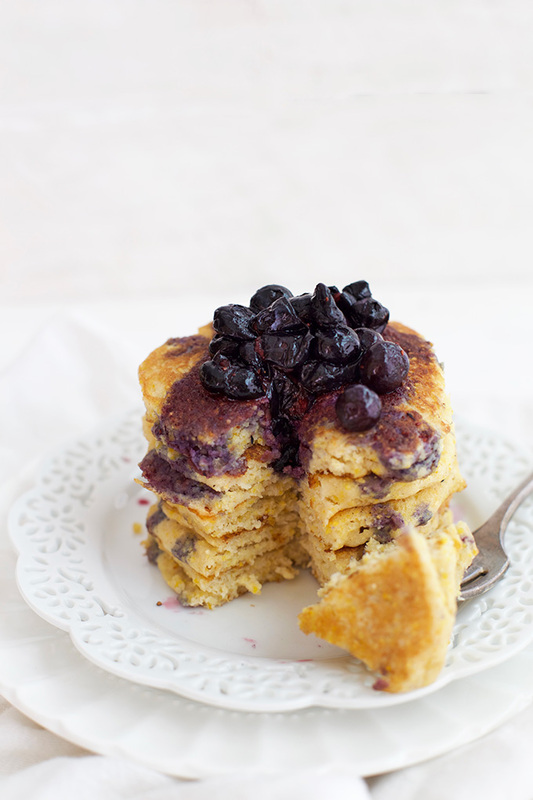 Holy Moley those Cornbread Pancakes with Blueberry sauce look and sound beyond AMAZING! Yum!! Made this recipe a few weeks ago. DELICIOUS! My pancakes were not fluffy; however, I must say I realized I was out of baking flour and had to sub with millet flour for 2/3 of it. Def will make again!